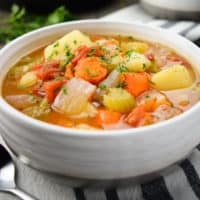 Instant Pot Vegetable Soup is a classic homestyle recipe made with simple ingredients. It’s super easy to bring together making it an ideal weeknight dinner. 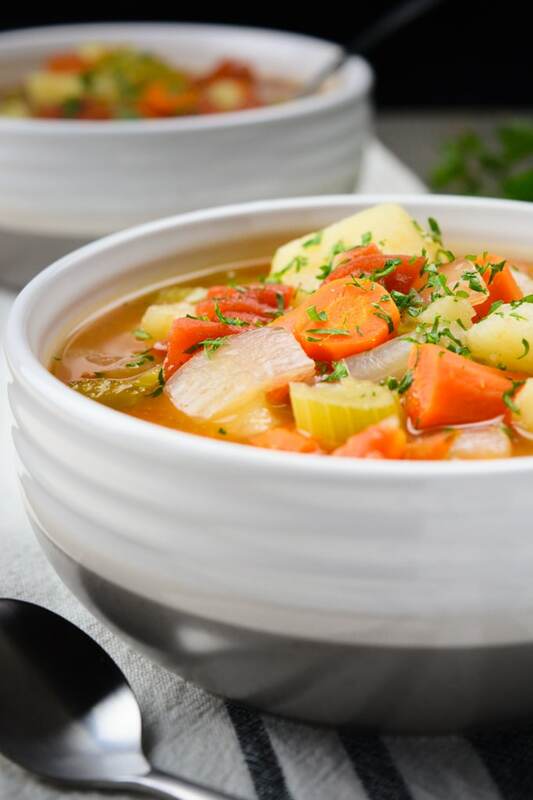 This healthy, flavorful chunky vegetable soup is vegan, vegetarian, gluten free and allergy friendly! However, feel free to swap out any of the veggies for ones you may need to use up in your fridge. And, don’t be afraid to play around with the recipe by adding rice, beans or even pasta (see the notes below the recipe for amounts). They’ll add an extra dimension to this classic soup! This Instant Pot Vegetable Soup comes together in minutes, and is ready just as fast! Toss all the ingredients right into the IP -no need to sauté any vegetables. Set it to manual/pressure cook for 10 minutes and walk away! Allow the Instant Pot to naturally release pressure for 5-10 minutes and you’re ready to eat! 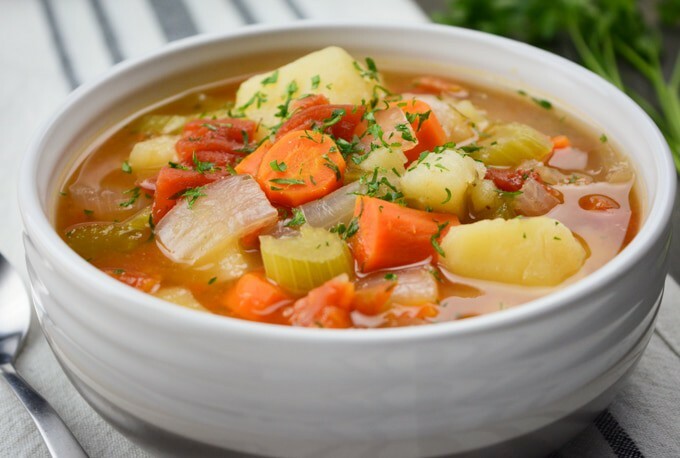 Why should you make Instant Pot Vegetable Soup? It’s a cinch to bring together. Full of healthy whole food ingredients. Perfect for keeping warm on those cold days. Ingredients are interchangeable to what you have on hand. Great for using up leftover veggies. It’s a fool proof recipe. 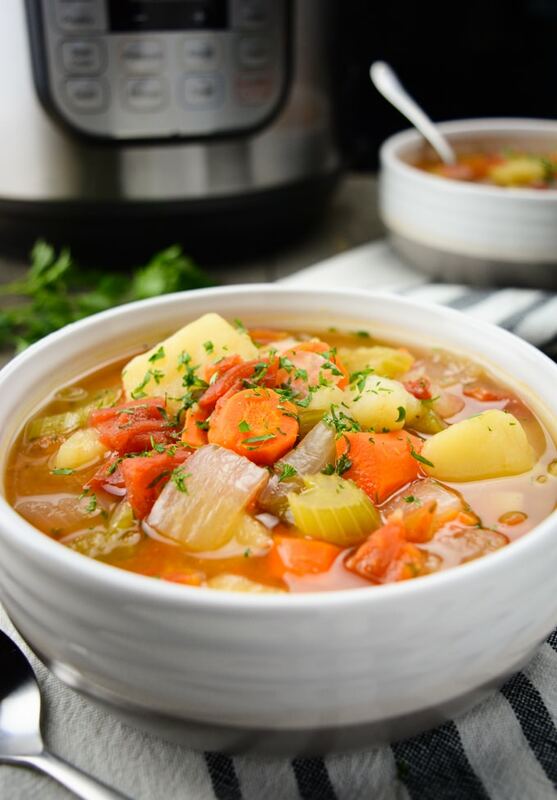 This rich and flavorful Instant Pot Vegetable Soup is sure to please even the pickiest of eaters. From adults to kids, this soup delivers a ‘gotta have it’ taste that will keep your Instant Pot busy all winter long. If you don’t own an instant pot yet, get one here! And in the mean time try the stovetop directions. If you loved this recipe, please leave a 5 star rating in the recipe card and share your thoughts in the comments below. Also, if you snap a photo be sure to share it with us! We love to see your creations! You can find us on Pinterest, Facebook and Instagram. 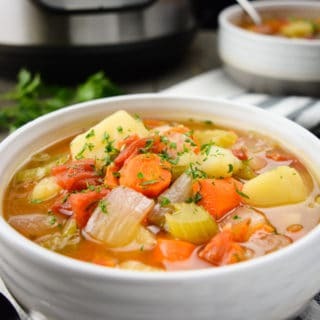 Instant Pot Vegetable Soup is a classic homestyle recipe made with simple ingredients. It’s super easy to bring together making it an ideal weeknight dinner. 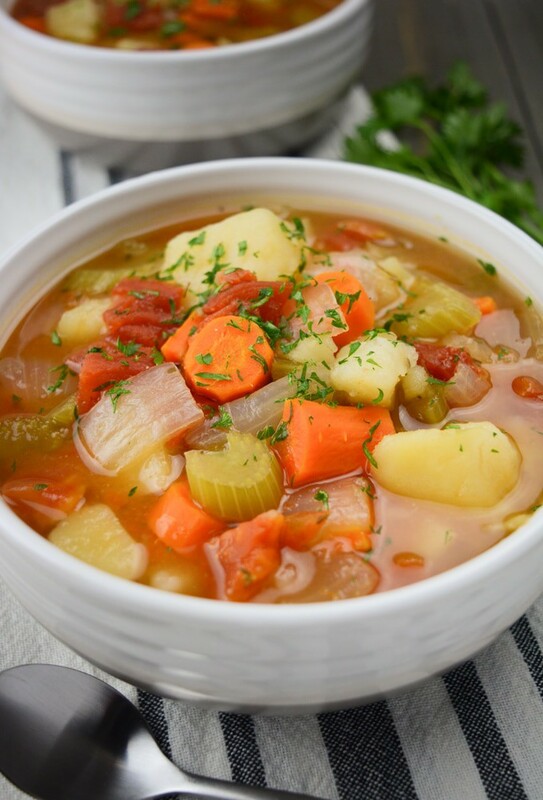 This healthy chunky vegetable soup is vegan, vegetarian, gluten free and allergy friendly! Roughly chop the vegetables into big chunks. Add everything to your Instant-Pot. Make sure the liquid is covering the veggies. If you added extra vegetables you may need to increase the broth and seasonings. Press the manual/pressure cook feature and set the IP to 10 minutes at high pressure. Allow the soup to naturally release pressure for 5-10 minutes, then turn the steam knob and quick release the remaining pressure. Carefully open the lid and give the soup a stir. Serve warm with your favorite breadsticks, side salad, crusty artisan bread or saltine crackers. Add everything to a large soup pot and bring to a simmer. Then cover and simmer for 35-45 minutes, stirring occasionally. 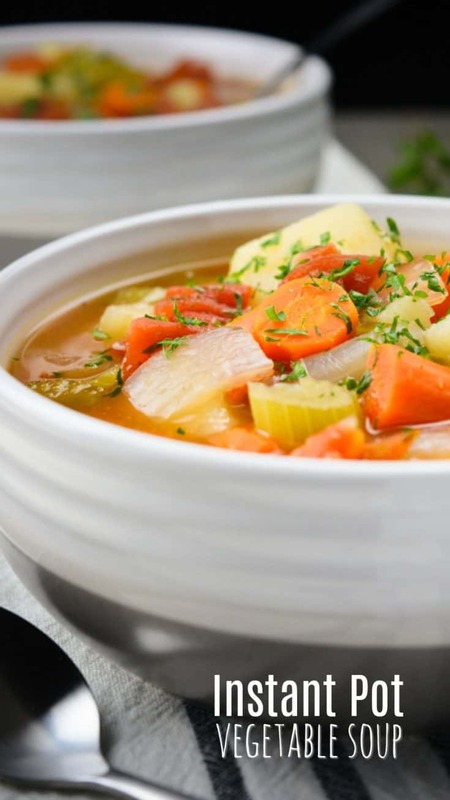 The soup is done when the vegetables are soft and the potatoes are tender. Serve warm with your favorite crackers, breadsticks, side salad, or crusty artisan bread. *Making this soup ahead of time allows the flavors to really come together enhancing the taste. *Add a few Tablespoons of tomato paste to increase the tomato flavor. *If you decide to add pasta to the soup, I suggest using no more than 1/4 cup (1/2 cup for larger pasta), increasing the broth by at least 1 cup and adding in extra seasonings. *If you decide to add rice to the soup, I suggest using about 1/4 cup, increasing the broth another 1/2 cup and adding in extra seasonings. 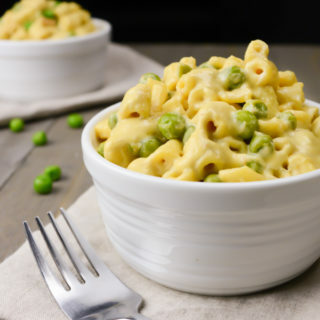 My husband and I are not vegan but this we are IN LOVE with this recipe. Our babies even ate it! Can I just use water instead of veggie broth? I’d like to just negate the extra sodium.. Do you think I can get a decent flavor?? Thank you! I think water would be too bland. Maybe try an organic low sodium vegetable broth like this one (affiliate link) and lessen the added salt? Or you can also make your own broth by simmering veggie scraps with a few seasonings for 45 minutes then strain. 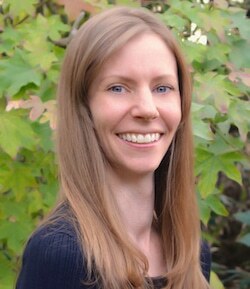 Snow here with frigid cold temps, so definitely not venturing to the grocery store with all my kids. Just threw this recipe together using leftovers from a veggie tray and the last few potatoes in the bag. Turned out perfect and perfect so a cozy indoor kinda day! I just brought the Instant Pot so I can make healthier meals. This recipe is simple and inexpensive. Thanks so much! 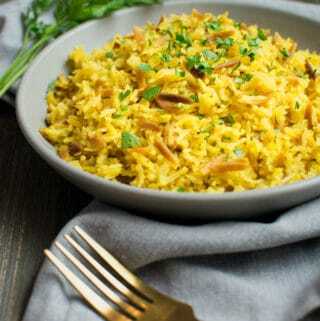 Easy, simple and delicious recipe ! Easy, delicious, 3 year old loved it! If you add canned beans using the instant pot when do you add them? I made this soup on the stove top for a quick lunch for my husband and father who were doing some spring outdoor work. I served it with sour dough bread, not much else in the house. They both loved it. My husband said it was even better the next day. I am not vegan so the only thing i changed with chicken broth for the vegetable broth. Solid recipe, I can't wait to check out what else you have. Sounds so cozy - and looks so colorful! My kind of soup! I just love a good, wholesome, delicious meal that comes together in minutes. Thanks for sharing this!